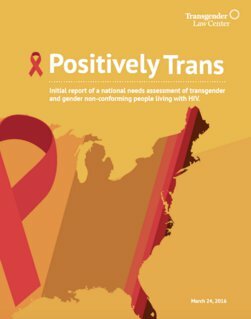 On March 24, Transgender Law Center released the first report of findings from the Positively Trans survey, a first-of-its-kind community-led project focused on the lives and experiences of transgender people in the U.S. living with HIV/AIDS. Some of the starkest findings outlined in the report concern income, education, and history of incarceration. While 64 percent of respondents had at least some college experience, a full 43 percent earn less than $12,000 a year. Additionally, 41 percent had some history of incarceration, and of those who had experienced incarceration, more than one in two had gone at least 6 months without medical care since their diagnosis. In addition to providing a richer picture of the realities of life for transgender people living with HIV, the research indicated paths for action. When responding to questions about priorities and health concerns, HIV-related discrimination topped the list of legal priorities for transgender people living with HIV, with discrimination around employment, public accommodations, identity documents, and housing close behind. Top three health concerns were gender-affirming and non-discriminatory care, hormone therapy and side effects, and mental health care. Based on these findings and the work of the nine-member Positively Trans advisory board, the report offers five recommendations for programs and initiatives to protect transgender health and access to legal rights. These recommendations include rights-based trainings by and for transgender people living with HIV, the development of support systems, and the implementation of economic initiatives to relieve barriers to care. As a companion to the research and as a leadership development strategy, Transgender Law Center has begun offering digital storytelling workshops to transgender people who are most impacted by or living with HIV. The first round of videos, produced in a workshop with Black transgender women from the South, premiere this evening at a launch event in Atlanta, Georgia.